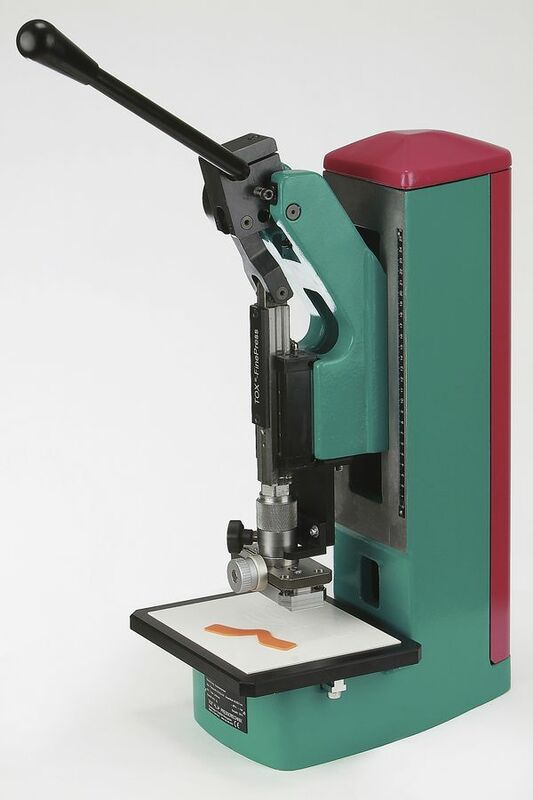 The specimen die cutter STAS.01 is a knee lever unit with a very smooth running ball bearing linear guide. It serves to produce specimens made of rubber, elastomer or plastic. This system is characterized by a finely adjustable punching shear position affecting the cutting die. Furthermore it has a forced eject system at its rearmost end. The basis of the unit consists of a cast steel frame (1). By a fast-clamping system of a fine adjustment (2) it is possible to adjust the punching shear position precisely. After processing the specimen it is automatically released by the ejector (4). As a counter bearing during processing serves a flat support plate (3). The die support is made of cardboard (5 - see accessories) and serves - while a specimen is processed - as an exchangeable protective element for the cutting edge and also guarantees exact cutting results. The knee lever die cutter is shown with a punching knife unit (6) and clamping adapter (7). Technical drawing of the STAS.01 Dimensional view of the unit including a 3D view (A4).